The Internet is a wonderful thing. Those of you who read my IMK post this month might remember my lament about how I used to have a great recipe for an oat and sultanas slice but had mislaid it. It is a popular slice and there are many recipes for it, all with varying amounts of the basic ingredients. I tried a couple but none tasted as good as I remembered my old recipe tasting. Madge mentioned she had the recipe she thought I was seeking. And it was it! Thank you so much, Madge. It is a funny thing. I knew it was the right recipe when I was putting the ingredients into the size tin Madge suggested and I thought, “This tin is too big for this amount of ingredients.” Then I smiled. I remembered that I used to make an Alfoil insert to reduce the size of my tin. (It was before I had every size tin there is). I transferred the ingredients to a 23cm square tin and it was perfect. I highly recommend you line your tin with baking paper. I lined and buttered the base but only buttered the sides and they stuck a bit. Melt the butter and honey together. I did this in the microwave. Add the butter and honey to the dry ingredients. Mix until the ingredients clump together. Press firmly over base of a lined 23cm square tin. Bake at 190°C for 15-20 minutes until golden. Cut into bars while hot. Remove from the pan when cold. 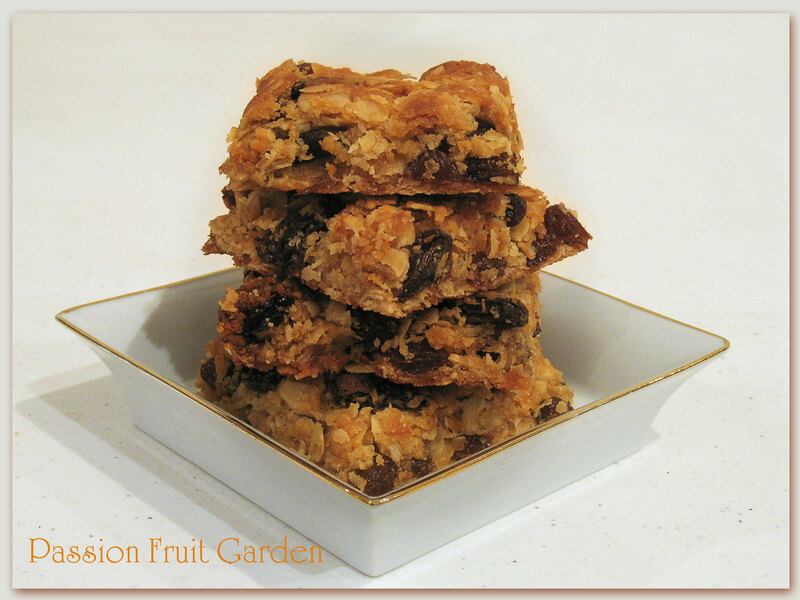 This entry was posted in Biscuits & Slices, Sweet Things and tagged Honey oat bars, Oat and sultanas slice by Glenda. Bookmark the permalink. How lovely! Yay for Madge. Hi Mandy – Yes, Yay for Madge! I was just admiring those in your IMK post so I’m really glad that you’ve posted the recipe now. I’ve never seen these before but they do look very good & easy to make. I had to look up sultanas – see all the things you learn on these blogs – I love it! Hi Diane, This is such an old recipe and they taste great. You could possible reduce the sugar a wee bit. So what do you call sultanas? Golden raisins? oh, golden raisins, yes – that would be it. Sometimes the old recipes are so classic you just have to stick with them. I made a brick cake yesterday and it reminds me of your slice. Put half in the bottom of the pan, add fruit of any sort and pat the rest of the mixture on top and bake. 🙂 I love this stuff. Hi Maureen – its so simple. We have already finished it. I think maybe a little less sugar may be the go. Damn, i just want it on my lunch box! this cookies made me not feeling guilty to eat it…. Hi Dedy. This is a very simple slice to make and delicious. I am sure it would be perfect in your lunch box! Ella, you are exactly right. Madge said she has been making this recipe for years and I used to make the one I had all the time. I have just been munching away and there is a lot of sugar in there, maybe we could reduce it a wee bit. Too sweet for me now – I’d have black tea and make the slice with a lot less less sugar, and a taste of honey. It’s amazing as a kid how much sugar your body can use up. This is definitely an old recipe, a cup of this and a half cup of that- and it tastes great. I am amazed how many recipes there are out there with the same ingredients but with different quantities and they don’t taste nearly as good. I made 2 batches of this slice on Saturday so as to allow the kids to take to school in their lunchboxes. All gone by Sunday! Note- I found it easier to cut when they were (almost) cool, rather than when they were hot. Hi Em, It is pretty good isn’t it? I cut it when hot and then cut it again (along the cut lines) when it is cold and I want to take it out of the tray. I do think double quantities are the go. Maus and I ate one lot in a day.